I was on a shop hop yesterday and got quite the haul! I'll show you everything tomorrow. But, since I was doing that all day, Flimsy Finish Friday is a bit late (no apologies because I had too much fun!). I've been waiting to share this one for a while. I test quilt patterns for Persimmon Quilts. 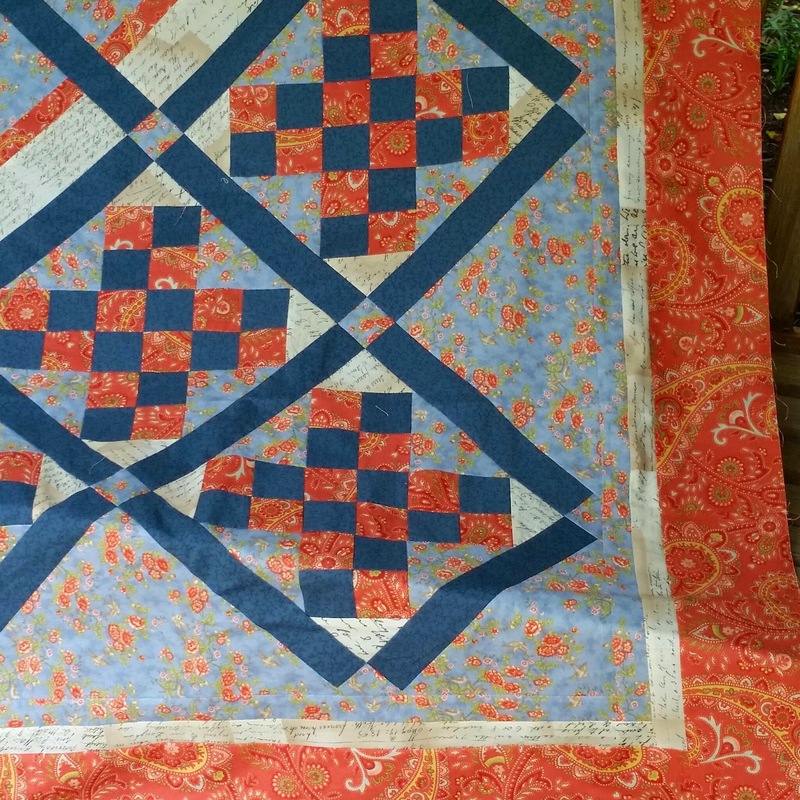 She runs a free mystery quilt series for QOV. She got the last clue posted for this one last Saturday so I am free to share my pics this week!!! Isn't it goregous!!! I used some of my stash fabrics to make it and love the way it turned out. The cream is a script print from Michael Miller from ages ago. And I believe the light blue and red are prints from April Cornell. She was one of my favorite Moda designers and I hoarded stashed away a ton of her stuff. This one came out blurry and I just caught it so sorry about that, but it is the center square of this quilt. The quilt was sewn on point. Here's a closer shot of one of the corners. Please go on over and choose one of the fabulous mysteries that LeAnn has posted. She hasn't taken any down from the beginning and you'll have a great time making a quilt for a very worthwhile cause!!! 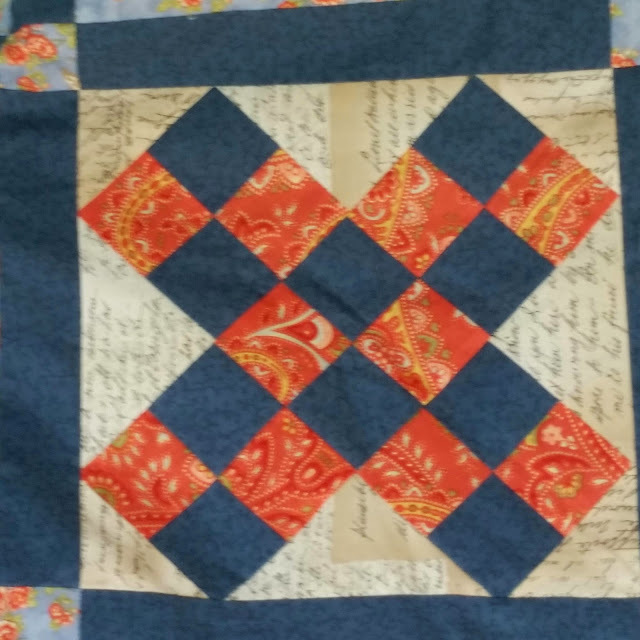 Linking up with Crazy Mom Quilts and My Quilt Infatuation and with Val's Quilting Studio for Tuesday Archives. 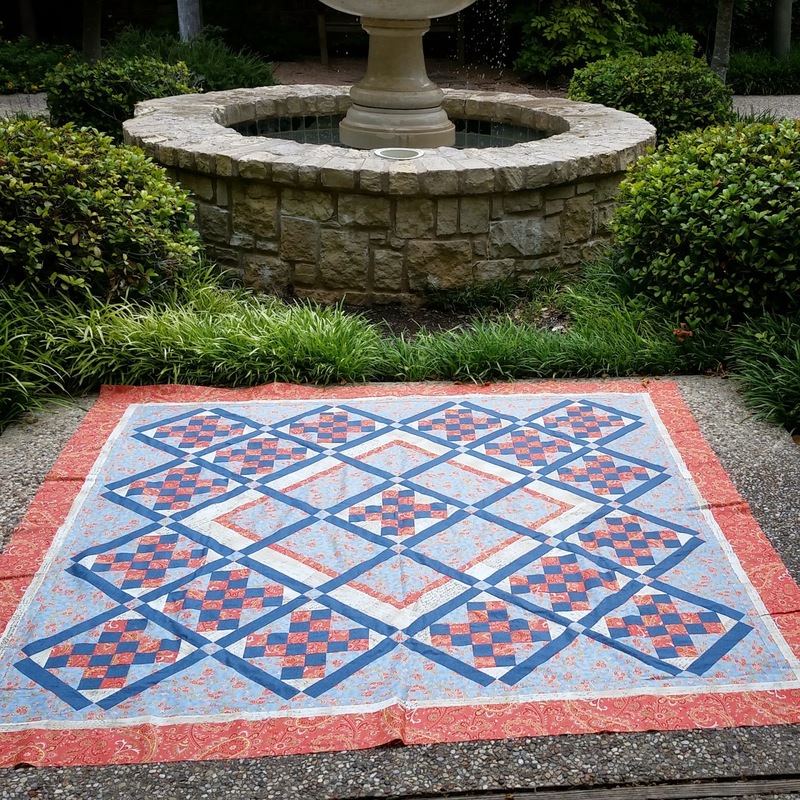 Beautiful job on your quilt! The mixture of fabrics are pleasing to the eye, and I love how the pattern frames the center block. Very nice! 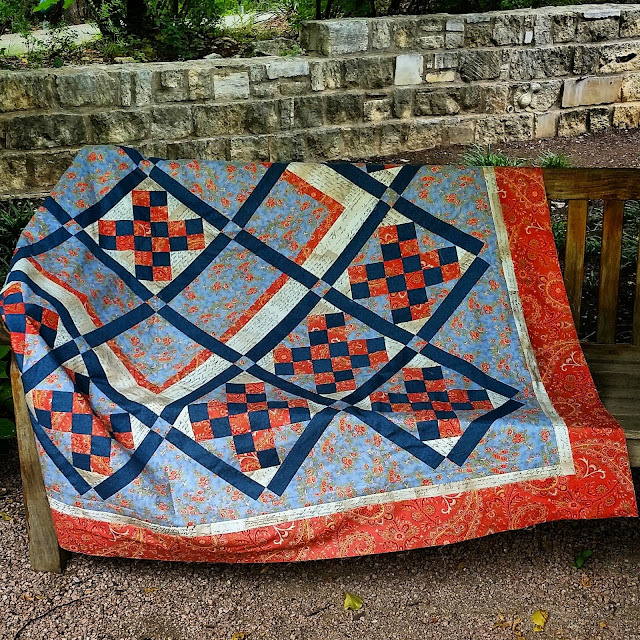 Your quilt is beautiful and the photography is too! I particularly love your fabric selections. Beautiful quilt and the setting is great. What a fun setting for this quilt. Looks like a successful mystery. I too like the setting for this quilt. You color combination is so pretty too. Thanks for sharing at Tuesday Archives...maybe I shouldn't be so scared to try a mystery quilt! !